This article is an excerpt from my PhD thesis, posted here after a discussion on the IASPM email discussion list earlier today. I’ve added some media to make it easier to hear the songs. Stock, Aitken and Waterman were one of several case studies I undertook to compare approaches to creative collaboration in songwriting teams (another was Mona Lisa by Jay Livingston and Ray Evans). I was particularly interested in SAW’s ‘hit factory’ approach and rapid production-line methods. Most of the quotations are from The Guys Who Wrote ‘Em: Songwriting Geniuses of Rock and Pop (Egan, 2004). Thanks to Mike Stock and Phil Harding for proof-reading and comments. In the late 1980s the UK’s most successful songwriting and production team consisted of Mike Stock, Matt Aitken and Pete Waterman (SAW). Between 1985 and 1990 they achieved more than 100 UK top 40 hits and sold more than 40m records. Stock and Aitken were the studio-dwelling songwriting/production dyad; Waterman did not write music or lyrics but acted as ‘publicist, industry insider and talent-spotter’. All three were credited as songwriters on their recordings, and all received equal royalty shares of the publishing for the majority of the songs. The SAW team provided songs and complete backing tracks for pop artists of the era, including Kylie Minogue, Jason Donovan, Mel and Kim, Rick Astley and Bananarama. Their success was such that long-established artists such as Donna Summer, Cliff Richard and Georgie Fame recorded their songs as singles in an attempt to capitalise on the ‘SAW sound’. Songs were created in the studio as a complete backing track without a demo stage. Studio tools included a Linn 9000 sampling sequencer and an Emulator II sampler, although most audio sources were recorded to 24-track 2-inch tape, which recorded (up to) 24 audio sources and provided the master timecode that drove the sequencer and the additional MIDI sound sources that it triggered. This technical information is relevant to the songwriting process for two reasons. First, being contemporaneous state of the art equipment, it enabled the production of full and final recordings, eliminating the need for a demo, and secondly, being hardware-based it was extremely technically stable, supporting the prolific song output that led to the team being described as a ‘hit factory’. It is clear that productivity was a driver for the design and maintenance of the songwriting environment. Stock and Aitken, with occasional visits from Waterman, operated a 5-day week, and established a working method where the artist would arrive at the session with the sole purpose of providing the vocal to a pre-written song, usually to be sung over a fully produced backing track. Post-production editing would take place after the vocalist had left the session, and Stock and Aitken would finish the final mix ready for mastering and release. There is some disagreement between Waterman and the other two team members regarding the former’s contribution to songwriting. Waterman contends that he played an advisory role with occasional partial veto of finished mixes, but Stock and Aitken state that this role was negligible. All parties agree that Waterman did not create original musical material or participate in hands-on studio production activity, and Stock and Aitken acknowledge the occasional contribution of a title concept, but in practical terms Waterman did not write or produce songs, not least because he spent very little time in the studio due to his industry/media activities. [Stock]: we had never met or heard of her. It had been arranged with our business affairs guy at PWL, David Howells, that she would come in to record a song with us but somebody forgot to tell us. And of course we are working with artists every single day and we’ve got them queueing up. So this girl arrives and says, ‘I’m going back to Australia this afternoon’. And I don’t like necessarily saying, ‘it only took 20 minutes to write the song’, but it did. We were under pressure. We had to get it together. We got it together, we got her in, we got her on the way. We then put the effort into finishing off after she left. But in fact, it underplays it to say it was a 20-minute song. It obviously has all our experience and at the time we were on fire. We could sit down and write it. We wouldn’t be able to do that now. We’re sort of out of training for that. [Aitken]: we were thinking of doing a song that we’d already written because she was in a rush. I wanted to do one of the songs that perhaps haven’t made it onto a Bananarama album because we were under the cosh [but] Mike didn’t want to do that. And I said, ‘if we do something that we haven’t spent time on, it might not be as good as it could be’. And [one of us] said, ‘she should be so lucky to have one of our second best songs’. Stock: [and we thought it] would be better if it was ‘I should be so lucky’. Here we see that the songwriting team is responding to some very specific and known constraints. Before problem finding can begin, the circumstances of the recording session and artist’s schedule define some particular problems that must be solved. In this case, the constraints are Minogue’s availability, the time available before the vocal session, the tacit agreement that Aitken and Stock would work with any artist that Waterman or his company signed, and of course the musical and production characteristics of the ‘hit formula’ that the trio were known for. The group agreed to take the job, knowing that they had a backup plan (the unused Bananarama song), but as Stock observes, the dyad were ‘on fire’ at that time so could write a song in 20 minutes. This time-efficiency is partly attributable to some known creative constraints that were always used in their songwriting and production, including the technically stable production environment, a known timbral palette, the willingness to work within (albeit occasionally to challenge) traditional song forms, and of course SAW’s famously self-referential harmonic backings. [Stock]: don’t take this too literally, but Never Gonna Give You Up, I Should Be So Lucky, This Time I Know It’s for Real, some of our biggest multi-million selling singles have a similar chorus chord sequence. There were variants in that – it wasn’t quite as simple as that – but they have tension inbuilt into the sequence. They’d feel emotional, normally because your roots aren’t necessarily the same as your chords… The same chord sequence as Land of Hope and Glory. It feels stirring. When you’ve got to those chord sequences going it’s really great. You can feel it – it really does take off. The chord sequence that Stock refers to (also in Rick Astley’s ‘Together Forever’ and many others) is | IV V | iii vi | – half bars in 4/4 (similar to the final bars of the main theme from ‘Land of Hope & Glory’). Aitken describes the use of this sequence as follows, noting the delay of the resolution to the I chord as being a deliberate tension-and-release compositional device. …We always felt that being in a major key was better for an uplifting chorus … and we tended, in the early days particularly, to write verses in a minor key, which is a bit more ‘down’. [At one point] we decided to use a particular set of chords which had been used a million times, which happened to suit us very well because it is major, but it’s rooted on the fourth of the [home key] chord rather than on the actual key, top tonic, and, in that it creates its tension. You’re actually in a major key but it’s not that major, it’s less major, because you keep descending into … the minors surrounding it. It never actually settles until the very end of the chorus and then you give the game away and then everyone’s happy by then. We developed… endless variants. [Later] we got hits with The More I See You  chords… a slightly different variation … which keeps modulating between two keys. This delay of the tonic resolution is common to a number of songs in their catalogue. There are several other regularly-used harmonic characteristics of SAW’s songwriting, including looping ii – V – I patterns, first inversion iii chords resolving to vi, and, interestingly, a greater use of key changes than was common at the time, which the dyad imply to be a deliberate challenge to listener expectation in order to create tension and release. [Stock]: sometimes we’d shock with an impossible key shift to lift it, but very often we put key changes into the chorus… [we tried to] get the melody to go through those key changes imperceptibly so that people didn’t realise they were being lifted up, otherwise it sounded awkward. [Aitken]: [semitonal ascending key changes] would be too obvious. Very often … we got from the first bridge chorus, chorus – fine – and then suddenly we have this bomb that’s the verse and … the real hard point would be disguising it. But then sometimes we’d say ‘F*** it, it sounds great to suddenly go brrrr like that’. 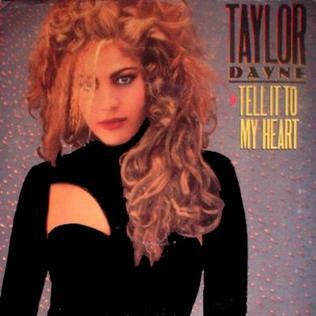 Taylor Dayne – another fan of the IV-V-iii-vi harmonic loop, and appearing in the top 10 singles at the same time as Kylie. The harmony of ‘I Should Be So Lucky’ is adventurous compared to most other top 40 pop songs of the era – it contains more key changes than any other song in the contemporary UK top 10 singles chart (February 1988). It is interesting to note that SAW were not alone in some of their harmonic tendencies – Taylor Dayne’s ‘Tell it To My Heart’, also in the top 10 that week, uses the IV – V – iii – vi sequence as its chorus backing, albeit with whole bar changes. In addition to SAW’s aforementioned self-imposed constraints (instrumentation, timbral palette and to some extent harmony) there were others that were imposed by the artist, and, in the case of ‘I Should Be So Lucky’, the vocalist’s technical limitations affected the melodic content. Stock’s comments below demonstrate that he was working simultaneously as producer and songwriter, adapting his melody according to the vocal qualities of the artist while ensuring that an emotionally affecting recorded performance was achieved. ‘I Should Be So Lucky’ was certainly custom-written for Minogue. One might argue further that her higher/weaker vocal range made a meaningful contribution to the melody, albeit a subtractive one, by imposing a constraint that was previously unknown to the songwriters. It is demonstrably true that the melody of the verse was changed as a result of the vocal constraints provided by Minogue. Melodically, Stock’s creative decision is a logical response to the constraint – a [middle] C#-centred verse melody would have been fine for a powerful alto singer, and difficult for Minogue’s fragile throat-voice soprano. We can speculate fairly accurately what the original C# melody would have sounded like, although it could not have been an exact parallel diatonic third below the actual melody that we hear in the finished single but would, if consonant with the target tones of the underlying chords, probably have used a 3-note pattern of C#, B and A over the words ‘my imagination’. Therefore this original working melody on C# would, for the most part, have been a diatonic sixth below the melody that was eventually sung by Minogue. We did restrict ourselves with a scaffolding. First of all we knew it was a three-minute pop song. We knew we had to get everything in and out [in that timeframe]: three choruses at least, so everyone’s heard it. That general restrictiveness meant you had to be more creative within the framework. All those restrictions that you place on yourself force you to be a bit creative. It’s how you break those rules… that gives you your unusual twist sometimes: ‘oh hang on, this bridge could be two bars. That’s going to throw a few people. It means the chorus is going to come in quicker – people are going to be taken aback by it’. Aitken: [comparing two Kylie Minogue singles] They’re rhythmically, harmonically, melodically different. The common factor uniting those is (a) we played them and (b) she sings them with the same ‘band’. It’s going to sound a bit the same, isn’t it? […] We were the writers and musicians on everything, and […] the backing band. We thought we had a claim on the recording copyrights. He did it all secretly… We were in the studio giving our whole working life… to the cause of making Stock, Aitken and Waterman … we were the engine house. During their most successful period, SAW chose to combine songwriting, production and business activities, and to acknowledge Waterman’s contributions via one third of publishing royalties. For a number of years this model was culturally and industrially effective, almost certainly due in part to the enhanced group skillset available to the partnership. Musically, Stock and Aitken had many overlapping skills (they were both composers/lyricists/producers), but had less interest in the business deals and media networking at which Waterman was so adept. Creatively, the Stock/Aitken dyad generated songs consistently according to an agreed co-writing methodology. The arguably ‘non-creative’ Waterman contributed not only business opportunities (before and after the co-write session) but also creative constraints (via the artists that he selected) to which the core dyad were able to respond. Despite Waterman’s lack of musical or literary contributions, he could arguably still be considered a collaborator – because without his involvement these songs would not only have sounded different, but would have been less likely to become hits. He introduced business constraints – singers, deadlines, target markets, clients – that materially influenced the musical and lyric content of Stock and Aitken’s work. We can therefore argue that Waterman was partly responsible for creating value in the song, even though he did not write any part of it. Egan, The Guys Who Wrote ’Em : Songwriting Geniuses of Rock and Pop, 283. PRS for Music, Database Search Results. Performing Right Society, 2010. Les Sharma, “Phil Harding at PWL (Pete Waterman Ltd),” February 20, 2010, http://www.lessharma.com/2010/02/20/mixing-with-the-mix-master-phil-harding-at-pwl-pete-waterman-ltd/. Egan, The Guys Who Wrote ’Em : Songwriting Geniuses of Rock and Pop, 294–5. More accurately, from Edward Elgar’s Trio from ‘March No. 1, Pomp and Circumstance’ Military Marches op.39, although the chords/inversions are not exactly identical to the SAW loop. Gordon, Mack and Harry Warren. The More I See You, 1945. Egan, The Guys Who Wrote ’Em : Songwriting Geniuses of Rock and Pop, 39. And in fact, greater use of first inversion generally compared to most contemporaneous UK pop. The dyad made extensive use of alternate bassnotes, mainly through first inversions of non-root chords but also through tonic pedal notes. There are five key centres. The verse is in A major, then B major, briefly in implied Em and D (due to a ii-V of F#m-B then immediately Em-A7), arriving at a chorus in C major (via a lead-in of another ii-V of Dm-G). Egan, The Guys Who Wrote ’Em : Songwriting Geniuses of Rock and Pop. Stock may be be misremembering the musical specifics. Any melody that starts on C# in A major when recontextualised using ‘exact parallels on the fifth’ [of the scale i.e. E natural] would not have resulted in the verse melody that is heard in ‘I Should Be So Lucky’, which starts on the root of A, meaning that the original C# focused melody would not have been straight-transposed. This illustrates the accuracy problems of using long-term retrospective interviews with songwriters as a primary source, but the point is clear enough – Minogue’s vocal range was an introduced constraint that materially affected the melodic choices made by the songwriting team. Egan, The Guys Who Wrote ’Em : Songwriting Geniuses of Rock and Pop, 306. Egan, The Guys Who Wrote ’Em : Songwriting Geniuses of Rock and Pop, 310. Where a session vocalist is used to sing the main melody in unison with the artist, often lower in the mix. Other thickening techniques include double-tracking the artist themselves and various pitch/time based effects to provide chorusing. SAW master recordings typically used track 23 for the main vocal and track 24 for its double-tracked version. Egan, The Guys Who Wrote ’Em : Songwriting Geniuses of Rock and Pop, 312. Pete Waterman Limited – Waterman’s record label (later Pete Waterman Entertainment). Egan, The Guys Who Wrote ’Em : Songwriting Geniuses of Rock and Pop, 321–322. Bennett, Joe (2014). “Constraint, Creativity, Copyright and Collaboration in Popular Songwriting Teams.” PhD thesis, University of Surrey, pp. 165-174. Very interesting read, thank you for posting. The final backing tracks would be built around the vocals. -“Technically stable (hardware-based) production environment.” This is a can of worms. To keep this as brief as possible: The Linn 9000 developed a reputation for being unreliable, so much so that it is said to be a major reason for Linn Electronics’ bankruptcy in 1986. Matt Aitken alludes to these problems in your quote. A further aspect is that not all parts were sequenced; Matt Aitken’s guitar, for example, and according to an interview with PWL Mix Engineer Phil Harding on recordproduction.com, synth parts were often played direct to tape. -In a nutshell, the production challenges faced by anyone in the 1980’s would be unimaginable to today’s DAW user. -I found the musicological analysis fascinating, and I think a more extensive review would be welcome and timely. Pete Waterman owned the record label (and the recording studio) – and basically hired Stock and Aitken as producers/writers. I guess it’s a case of semantics, but being the person who mixes the records, doesn’t make you the “producer”.